The 2018 Nobel Prize in Physics was awarded to Arthur Ashkin of the United States, Gérard Mourou of France, and Donna Strickland of Canada for groundbreaking inventions in the field of laser physics. The Nobel committee recognized Dr. Ashkin for his work on turning laser light into miniature tools. He invented “optical tweezers,” which use light intensity gradients from a highly focused laser beam to manipulate microscopic objects, including living organisms such as viruses and bacteria. This has changed the way we’re able to study microscopic life. 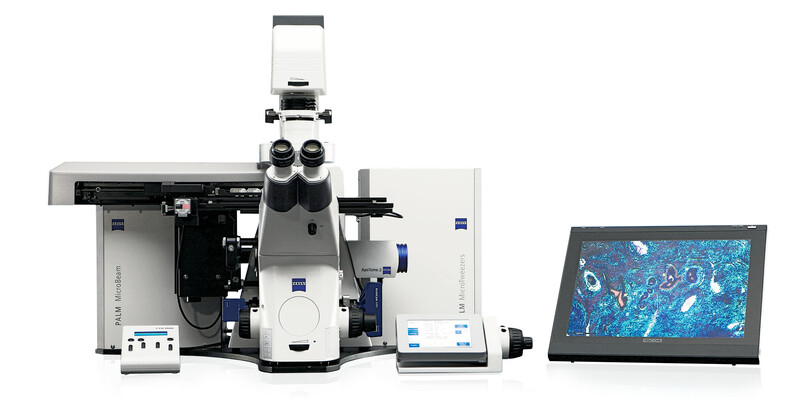 Based on this technology, ZEISS has developed PALM MicroTweezers – an optical tweezers system that allows precise, contact-free cell manipulation as well as the trapping, moving, and sorting of microscopic particles such as beads or even subcellular particles. The high intensity gradient of the focused, continuous wave laser beam keeps microscopically small objects within the laser focus by means of radiation pressure forces. PALM MicroTweezers works with a continuously emitting trapping laser (wavelength 1064 nm) which is coupled via the fluorescence beam path into a research microscope. The laser light is focused through a high numerical aperture microscope objective onto the sample. The wavelength of the applied infrared laser (1064 nm) prevents optical damage of living material. A specially designed beam splitter cube connects the microscope with the laser interface, enabling fluorescence illumination. This way, simultaneous fluorescence illumination and laser manipulation is possible, with beam splitters specifically designed for the selected excitation wavelengths. PALM MicroTweezers can be combined with the laser microdissection system PALM MicroBeam for cell fusion and assisted reproduction research. Optical Tweezers are used for the sorting and separation of different kinds of specimen in various areas of cell biology, microbiology, biotechnology etc., but also for minute force measurements, e.g. to measure cell membrane stiffness. PALM MicroTweezers certainly is the tool of choice in any experimental condition when contact-free separation or micromanipulation of the specimen on a cellular and sub-cellular level with highest precision is required. Dr. Ashkin was born in 1922 in New York City. He was awarded an undergraduate degree in physics by Columbia in 1947. He received a Ph.D. in nuclear physics from Cornell in 1952 and joined Bell Labs, the longtime hotbed of innovation and Nobel Prizes, in Murray Hill, N.J., where he worked until 1991. Dr. Ashkin began experimenting with lasers — beams of coherent monochromatic light waves marching in unison like toy soldiers — in the 1960s, shortly after they were invented. The same light pressure that sweeps from a comet’s tail, he noticed, could be used in the lab to push a microscopic ball around. To his amazement, the play of forces within the laser beam actually drew the ball into the center of the beam and trapped it there — a first step toward optical tweezers.